Martin Shkreli once bragged that he would go to a "Club Fed" instead of a real jail. Now he is inmate #87850-053 at a Brooklyn federal jail, which is about as real as it gets. "It's a tough place," said Robert Kipnees, a white-collar criminal defense attorney at the New York firm Lowenstein Sandler. Brooklyn Metropolitan Detention Center is a federal jail with a population of nearly 2,000. Shkreli will likely reside here until his sentencing on January 16. Shkreli, a former pharmaceutical executive, was convicted in August of two counts of fraud and one count of conspiracy for misleading investors in hedge funds he ran. He had been free pending his sentencing. But a judge revoked his $5 million bail on Wednesday for comments he made about Hillary Clinton on social media that the judge deemed a "real danger." Kipnees said that Shkreli could likely mingle with the general population, which typically includes suspected gang members, drug dealers, bank robbers, and others convicted of financial crimes awaiting trial or sentencing. "He's getting a taste of what he can expect," said Ira Lee Sorkin, the lawyer who defended Ponzi convict Bernard Madoff, who is serving a 150-year sentence in a medium-security federal prison in North Carolina. 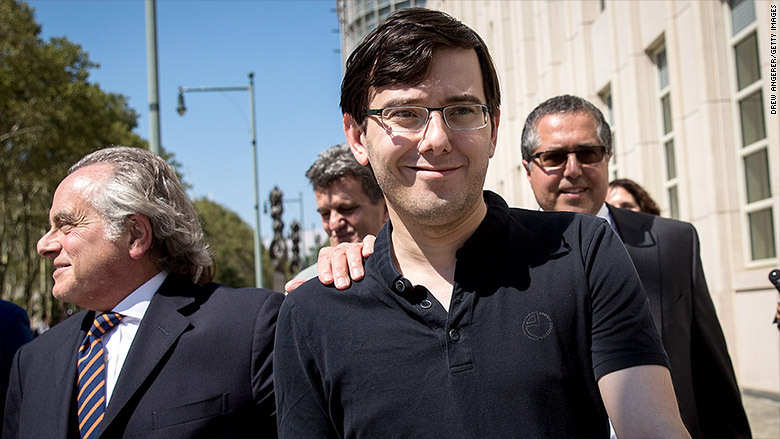 Shkreli first gained notoriety in 2015 when, as CEO of Turing Pharmaceuticals, he raised the price of a pill used by AIDS patients from $13.50 to $750. His bombastic personality and prolific use of social media has kept him in the spotlight since then. Now he is facing up to 20 years in prison. He's unlikely to get the maximum sentence because the victims of his fraud were investors in his hedge funds who eventually made money, Kipnees said. But the same behavior that prompted the judge to revoke his bail could keep him from getting a light sentence, or admittance to a low-security prison or prison camp. Shkreli, in a Facebook post earlier this month, had offered $5,000 to anyone who could grab a strand of Hillary Clinton's hair. "The judge has already interpreted Shkreli's behavior as violent and the public needs to be protected from him," said Sarah Walters, a former federal prosecutor in Boston who is now a white-collar defense partner for McDermott, Will & Emery. "That is a factor that could lead to an increase in his sentence." Larry Levine, director and founder of Wall Street Prison Consultants, said Shkreli "threatened someone who's federally protected." Levine is a prison consultant who served 10 years in 11 federal facilities for racketeering, drug trafficking, machine gun possession and securities fraud. He instructs his prison-bound clients on how to survive their time behind bars. He believes that Shkreli has his work cut out for him. "He's going to have to walk a fine line here in dealing with the inmates," said Levine, who spent part of his time in Los Angeles MDC. His advice for Shkreli? Don't be arrogant, and show some respect. "Tell him to keep his mouth shut, not to discuss his case, not to discuss his money, not to discuss his notoriety," said Levine. Shkreli's lawyer Ben Brafman declined to comment. -- Julia Horowitz of CNNMoney contributed to this report.